August Specials - and a Freebie! August is a month that finds herbies working hard to preserve the things from the garden, foraging, going on vacations, getting the kids ready for the coming school year, and just flat out busy. We have to work a little harder to interest you in our offerings at this time of year. So, we have a few cool things that we hope might tempt you. 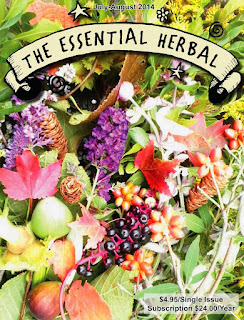 July/August 2014 The Essential Herbal is a print magazine (US and Canada), also available as a pdf (only pdf available outside US and Canada). 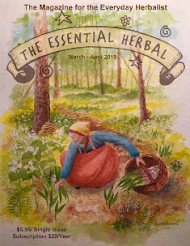 During the month of August, Tina Sams is the guest teacher in Rosemary Gladstar's Science and Art of Herbalism Online course. You can sign up now and get a $100 discount. Click here to take advantage of this offer. 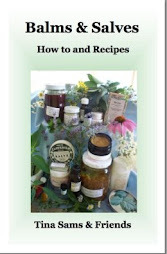 Tina will share a lot of great info and even a couple of books. If you've been on the fence, this is the best deal that's been offered on this course, and it is an opportunity to join the thousands of herbalists around the globe who have found their true calling through Rosemary's delightful take on the world of herbs. Use the code august on check-out from our shopping cart at www.EssentialHerbal.com and 15% will be deducted on everything except subscriptions, gift certificates, or wholesale. AND orders over $75 ship FREE inside the US! We will calculate shipping outside the US and contact you for payment prior to shipping. 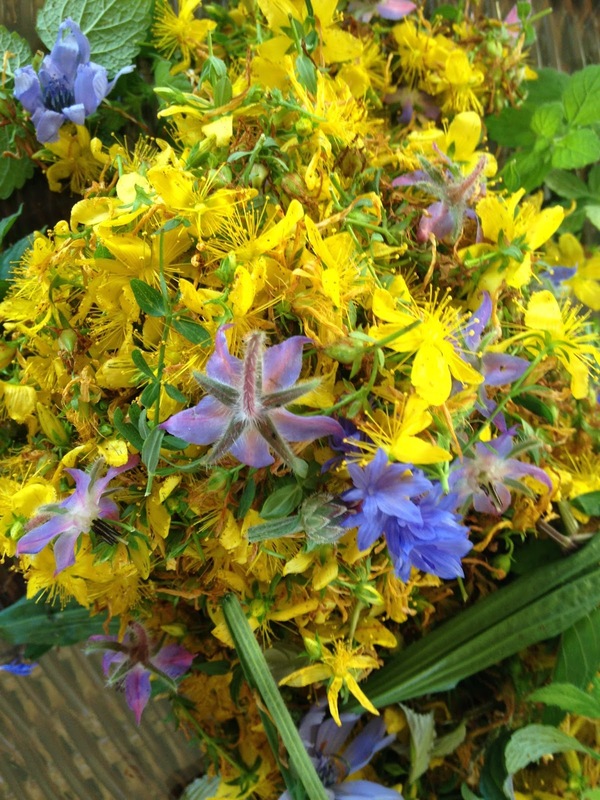 Lately Mom and I have been picking St. John’s Wort on a daily basis for one of our newer salves. It has been a mixed experience (sometimes fun, sometimes hot and unbelievably sticky) but I feel as though this bright and beautiful plant has definitely taught me a few things. I thought I could restrain myself and just bring one basket out. After picking my share of St. John’s Wort, however, I noticed that the plantain was popping up all over the yard. Might as well. Then the borage began to call my name. Wait is that a Calendula flower popping up? Before I knew it my basket was full of bunches of this and that every which way. It seemed as though the harder I tried to separate everything the more they mixed. The lesson I learned? Don’t try to restrain yourself, just bring more baskets. This really surprised me. Not because I think bees are bloodthirsty sting machines but because I’m taking away their pollen. Usually how it works is that I establish myself on one side of the bush and they gather pollen from the other side. And then we switch. Sometimes it takes several back-and-forths before both the bees and I get our fill but it has worked out pretty well so far. No bees or Mollys have been harmed in the harvest so far. The bees will also let you know if you have forgotten any flowers along the way. If you take your time and be patient you can usually follow the bees throughout the bush. Toward the end I was watching them and found an entire section unpicked! I was able to add even more than I expected to the infusions and have some bragging rights on the commune. With following the bees in mind I should really emphasize the need to be patient. If you pick too close to the bees they will let you know that it’s time to back off. Give them their space and they will give you yours. 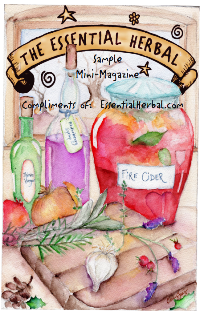 While researching for an article I wrote for The Essential Herbal Magazine I learned the origins of the phrase, “giving the devil his due.” In some instances it is what was lost before or during harvest from animals, weeds, or really any force of nature. I tend to think of this as a way of knowing when to stop. Sometimes when I’m gardening I focus in on the task at hand and I forget everything around me. This was the case with the St. John’s Wort. Before I knew it I was hacking through tall grass and terrifying baby bunnies to only get maybe ten flowers. It wasn’t worth the stress I put on myself and the environment. Since then I’ve decided to take Mother Nature’s hint and let a few things run wild. Don’t worry, there will be plenty next year if you didn’t grow as much as you wanted. Luckily in our world we are able to order what we lack or substitute. Don’t have any more spearmint? Well there is more chocolate mint or peppermint. Need some evening primrose? Luckily your neighbor had more than she could handle this year. Oh! And you can make it a trade by giving her some basil. 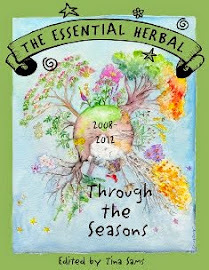 The world of herbs has a funny and beautiful way of taking care of itself so relax and look at the big picture. It’ll show up when you need it. Tansy is a hardy perennial with interesting button-like yellow blossoms. Today, it is used mainly as a decorative plant, but it does have an interesting past as a culinary and medicinal herb. The fernlike leaves and yellow blossoms are considered very toxic, especially when used in large amounts. The danger in the use of tansy internally is due to the presence of thujone, a toxic substance also found in wormwood. Plants vary as to the amount of thujone present, and where they are grown does not seem to affect the amount of the substance. Thujone is probably what also gives the plant its medicinal properties. In Greek mythology tansy was known for immortality. It supposedly conferred immortality on a boy named Ganymede. He was the eternal cup bearer of the god Zeus. 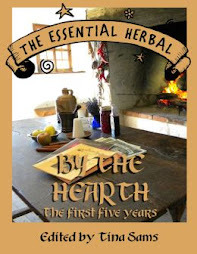 In Gerard’s Herbal, the flowers, which do not easily wilt, represent immortality. Using the herb was said to prolong life. Tansy was used at funerals because of its strong pine-like smell, and it was placed in coffins to repel insects. The strong smell of tansy made it useful as a strewing herb. It was well used in England in the sixteenth and seventeenth centuries, and would be tossed on floors to be trod upon to release its pungent smell, refresh the air, and mask unpleasant odors. King James II had 6 bushels of tansy and other herbs strewn along the one-half mile pathway to the throne at his coronation. Culinary history suggests that tansy was used in England to flavor cakes and puddings at Easter time. It was said to be a pleasant addition to salads if used sparingly, and some used it mixed with other greens as a cooked herb. It is also said to be one of the 130 herbs in the secret recipe for Chanteuse liqueur. 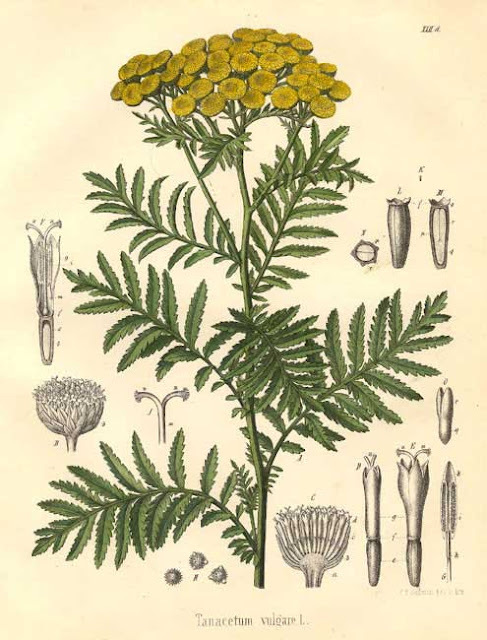 Tansy is used today, but sparingly, due to its toxicity. It has a strong peppery taste. The minced leaves have been added to scrambled eggs and to add zip to herb butters, poultry stuffing and omelets. As in the past tansy is considered a good herbal insect repellent. In colonial times, housewives rubbed fresh tansy leaves into tabletops. Also known as ant fern, sprigs can be placed on the threshold to discourage ants from entering the house. Tansy plants are planted alongside the entrance to the kitchen to keep flies from going in. As an ornamental, tansy is an excellent choice. The feathery leaves and bright yellow flowers are a nice addition to the perennial bed. Fernlike Tansy has a more delicate appearance, and has the same bright blossoms. The pleasant yellow color (though not as bright as the fresh flowers) is retained when tansy blossoms are dried. The strong erect flower stems make a nice addition to dried bouquets. The flower clusters are also attractive in dried herbal wreaths. 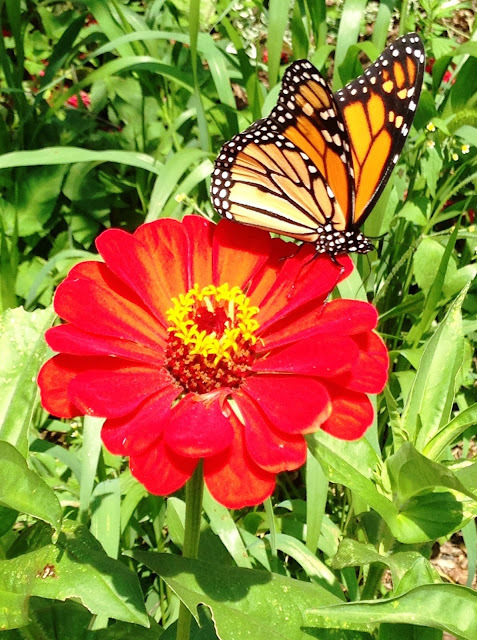 A tansy plant or two in the garden will yield lots of usable materials for insect repellent and decorative use.